On January 24, 1984, Apple launched the Macintosh personal computer. The event, immortalized by both Steve Job's presentation and Ridley Scott’s legendary television commercial, “1984”, propelled this “insanely great” little machine into the limelight and forever changed the world. 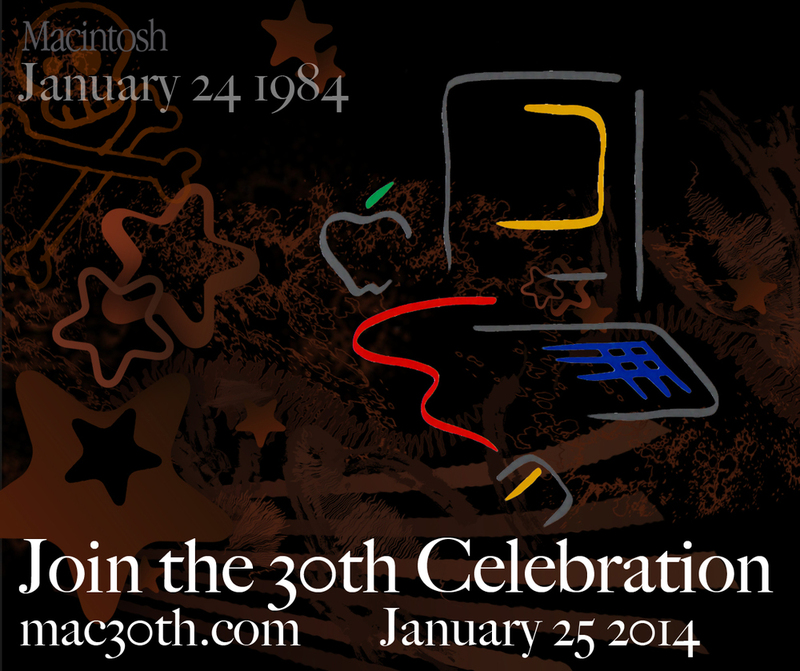 Apple Alumni are invited on January 25th, 2014 to join a celebration of the 30th anniversary of the introduction of the Macintosh computer. The event will honor the extended team that brought you this remarkable computer that popularized the graphical user interface and WYSIWYG software. The evening highlights are also the original team discussing the Mac's Conception, then the Birth and the Coming of Age. The Mac Commemorative Poster Project - Where everyone who enters a testimonial has an opportunity to post a photo of themselves, and for that photo to be on the Mac 30th Commemorative Poster. In honor of the original Macintosh Development Team, All Planet Studios, the Computer History Museum and Macworld/iWorld announce a celebration of the 30 year anniversary of the Macintosh. On January 24, 1984, Apple launched the Macintosh personal computer. The event, immortalized by Steve Jobs’ presentation and Ridley Scott’s legendary “1984” television commercial, propelled this insanely great little machine into the limelight and forever changed the world. On January 25, 2014 event organizers Gabreal Franklin and Daniel Kottke invite the public to join them in acknowledging the extended team whose efforts popularized the graphical user interface and WYSIWYG software and defined computing for the rest of us. The event will be held at the beautifully appointed Flint Center in Cupertino, CA, a few miles from the Apple campus, in the since renovated 2,300 seat auditorium where Steve Jobs introduced the Mac. In a series of panel discussions, members of the original team will share memories about the conception, birth and coming of age of the Apple Macintosh. Previously unreleased video will recreate those early days, and Ridley Scott will discuss production of the “1984” commercial. Stage events, testimonials and surprise guests will offer a treasure trove of recollections about the era. In one of the evening’s highlights, Mike Markkula will present People’s Choice Lifetime Technical Awards to the unsung heroes of the computer revolution—the original Mac team. The event will be capped by a musical performance by Cirque d’Mac, featuring Chris Breen, Bryan Chaffin, Dave Hamilton, Paul Kent and Bob LeVitus. Profits from the event will be donated to charities dedicated to promoting computer and Internet literacy. For further information, including interviews, contact Daniel at mac30th@gmail.com.